I recently took a trip to Lush Oxford Street and came away with these babies.I also picked up the new Rose Bombshell but I just couldn't wait to use that one as it smells of rose jam and was covered in roses - my perfect combo. Some of these I purchased myself and two of them were a gift from Daisy who we were visiting in London - thanks D! I have only used two out of the five photogrpahed here. The first one is Lover Lamp, the white bath bomb with red hearts (and pink stains from the others). I have had around five or six of these I really love them. Super moisturising and a lovely pink milky bath. When I have been in store the sales assistants have advised me this has a chocolate orange scent. I do agree but I also get a marshmallow vanilla too - it is just gorgeous. Lover Lamp is from the Valentines collection so won't be around forever, this is defiantly one I advise you try. If like me you love sweet scents but are no quite taken to the sugar highs of snow fairy then this one is for you. The second one is obviously the comforter. The raspberry ripple swirl bottom left. A sweet vanilla ice cream with a raspberry pop. A firm favourite and best seller. Pink Flamingo is one I have wanted to try for a while now. Mainly due to its kitch appearance. This is a reuseable bubble bar. Just like the cinnamon star I mentioned in my lush Christmas review. I have had hits and misses when it comes to these reusable bars as they can just fall apart. My tip would be to pat with with a towel after use and store it somewhere dry - an airing cupboard would be perfect. Then it should do it's reusable job. This has a fruity 'cocktail' inspired scent with ylang ylang and rosewood. Unicorn Horn. Again another name that shows you which one it is without me having to point it out. I have two as I bought one and so did Daisy. This is so bloody cute - a unicorn horn!! This is a bubble bar so I'd saw I'd get two baths out of this but you could easily get three. 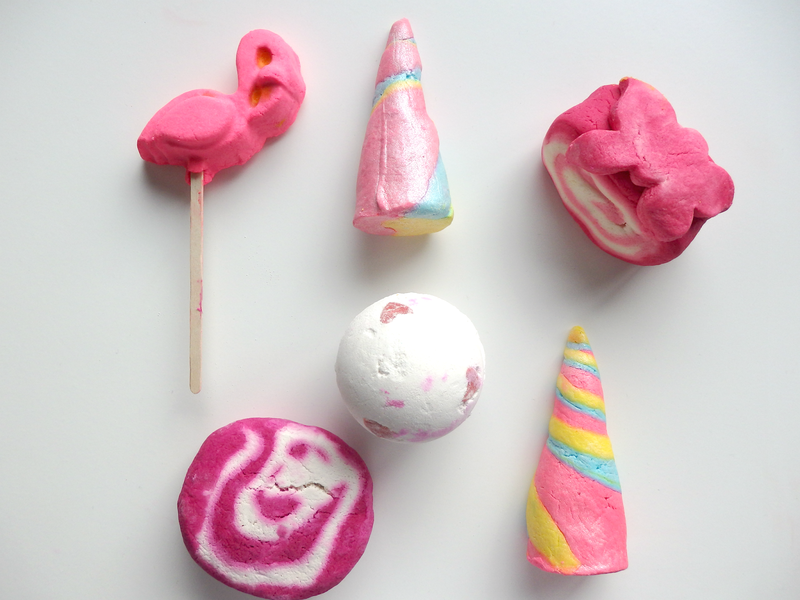 Lavender, neroli and ylang ylang give a comforting and relaxing bath - with just a touch of unicorn magic. Finally I have the Flutterby. A mother day product. Unfortunately this is not online nor did Lush's customer services have any information on it. I think it may be an Oxford Street exclusive. When I get more information on it I will update this post! It has a sweet scent but I wouldn't want to guess on where that scent comes from! I also picked up these two shower gels. Very his and hers aren't they? My all time favourite is Prince Charming. This is part of the Valentines collection so I get it while I can! A marshmallow vanilla with pomegranate freshness. It is perfect and I wish they did it all year round. It has been reformulated this year to a cream so is a lot more hydrating. Win. Dirty Spring wash is my partner's favourite. He uses this to wash his hair and body. I also love it in the summer. Minty fresh a perfect product for the men.